Historically these cancer drugs worked almost indiscriminately on rapidly dividing cells, usually poisoning them through free-radical toxic action. The chemotherapy drugs used are decided according to the type of tumour and its state of advancement. Some chemicals work directly on the rogue cell´s DNA; others on the receptors at the cell surface, trying to stop the rogue secondary messages getting through. The risks are largely in the side effects. Pills taken orally, or drugs administered into veins, poison the whole body. Indeed, some drugs are themselves carcinogens. The liver and immune system do their best to remove the poisons, but both are weakened in the process. Other rapidly dividing cells, such as those in the nails, blood, stomach lining and hair, also suffer. Nausea can also be a real problem, as it debilitates the patient. Also the blood count declines during treatment – less red cells mean less oxygen is carried round the body; less white cells mean the immune system (your natural defence against cancer) is weakened. Often after a couple of weeks and again around week six, the patient gets depressed. One reason is that lowered blood oxygen levels and depression are directly linked. Some patients lose weight. If this is too great it is called cachexia, and can be a cause of death. Although chemotherapy can be very effective, the success rate varies and in certain cancers can be as low as one per cent! A survey of 128 US cancer doctors found that if they contracted cancer, more than 80 per cent would not have chemotherapy as the “risks and side effects far outweighed the likely benefits”. You have to work out what´s best for you and your type and grade of cancer. A new breed of drugs is being developed – biologics, including such chemicals as mono-clonal antibodies. These are supposedly much more tightly targeted to you and your type of cancer, because they attack some particular genetic feature, protein or enzyme unique to the cancer. This is not every person responds to them; for example just 20 per cent of women who are HER-2 positive can use Herceptin. Tests should exist to find your suitability for these drugs or they can be wasted, your hopes unfulfilled. These new drugs supposedly have less side-effects but an article in the Doctors´ own magazine, the Lancet, expressed concern over levels of side effects. Clinical Trials were showing more side-effects in certain cases. However, the furure is less ´chemotherapy´ and more targeted biologic drugs to manage your illness and help you survive longer. So read on, talk to your consultant and then decide. 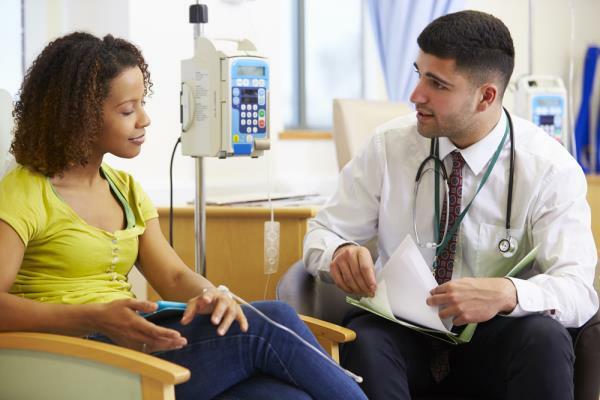 1: Make sure you know everything about the chemotherapy drug your doctor is recommending. You will find new drugs covered on this web site in our A to Z guide (click here). The very latest cancer treatments can be obtained on the Medcast website:http://my.webmd.com/medical_information/condition_centers/cancer/default.htm. 2: Ask your doctor why he/she is recommending chemotherapy. If they had cancer, would they treat themselves with this drug? How long have they been prescribing this treatment and to how many people? What are their expectations of this treatment for you? Are there other options which could produce the same results? 3: What has the success rate been? Does the doctor expect the tumour to go completely, or just reduce in size? Do they think your Cancer might become active again after treatment? If so, after what period of time? What else can be tried if the chemo doesn´t work? Are there any clinical trials open, which may be suitable for you? 4: What are the risks in having the treatment? How will your doctor assess its effectiveness? What are the worst reported and also the least reported, side effects during and after this treatment? 5: Ask your doctor what action he will take if you are losing a lot of weight and obviously not getting sufficient nutrition. Also, if you want to use herbal and natural remedies to help with the side effects, would he be prepared to work with you and discuss suitable treatments? Does he take any measures to support the immune system during treatment? If fatigue becomes a major problem, does he have methods for tackling it? 6: Check whether the treatment will affect fertility. If so, will you be offered opportunities for harvesting eggs/freezing sperm? 7: Prepare your body for the chemical onslaught: Take Astragalus, Cats Claw, Turmeric (curcumin) and echinacea to boost your immune system (all available in the independent Natural Selection shop – click here ). Try a corrective colloidal vitamin and mineral supplement. There is a lot of research on the benefits of medicinal mushrooms to improve chemotherapy results and cut side-effects. Eat a healthier diet cutting sodium-rich foods and eating more potassium-rich ones. Cut down on animal fats especially cows dairy, saturated fats and trans fats. They poison the lymph and inhibit the immune system. 8: icons integrative nurse Patricia Peat suggests consulting a holistic practitioner, nutritionist or medical herbalist as soon as possible to have a settled regime before commencing chemotherapy. But remember to tell your specialist what complementary treatments you are taking/having in case of possible reactions between the treatments. If he tells you that something is contra-indicated though, ask for the research evidence. 9: Next stage – During Chemotherapy, drink up to three litres of glass bottled or reverse osmosis filtered water a day and take your anti-sickness medication regularly to prevent nausea building up. (Peppermint tea, or an infusion of fresh ginger can help here. Some people even chew a small piece of raw ginger). 10: Eat small amounts of nourishing food regularly, rather than one or two large meals a day. See A Diet for Chemotherapy by clicking here. 11: Try to avoid all cows´ dairy, saturated and polyunsaturated fats and spicy foods. 13: On the subject of medicinal mushrooms, Dr. Julian Kenyon, from the Dove Clinic, advises protecting the cell mediated immune function with them. He says, “The one to take is Coriolus (as a powder), 4 grams, three times a day.” MGN-3 works in a similar immune boosting way. But these are expensive. You should also try to avoid an acid body. 14: Avoid all alcohol as your liver doesnt need any more toxins. It needs strengthening. Natural herbs such as 200mgs of milk thistle (Silybum marianum) and soya lecithin in research help to protect and help to “defat it. Supporting of the liver function is also helped by the use of N-Acetyl Cysteine, an amino acid which raises glutathione levels and helps the livers detoxification pathways. Focus on magnesium-rich foods. 40 per cent of the population are deficient. 15: Ask a cranial osteopath or acupuncturist to rebalance the energy flow around the body and help with nausea. Try yoga too. You can continue to see your hands on healer. 16: Force yourself to walk around and take exercise, even though you probably wont want to. This does not have to be strenuous but it does need to be daily according to a number of recent research studies. Yoga and Tai chi are not strenuous but have massive benefits even when its the first time you do them. As a minimum do 20 minutes deep breathing exercises every day. Get out in the fresh air. 17: After chemotherapy, try a Liver Flush using Epsom Salts and olive oil to clean up your system. But bear in mind that the chemical effects of the chemo will be expected to go on for 6-8 weeks after the last dose. 18: Astragalus, Cats claw, Echinacea and Cassie tea (Essiac) can all be taken after treatment is finished, to re-stimulate the immune system. Kerep yeasts in check with Pau Darco, oregano, cinnamon and wormwood, plus a multi-strain probiotic. Adults can also take wild yam to boost their DHEA levels; everyone can eat salads and carbohydrate in the evening (carbohydrates and salads aid seratonin production, which in turn stimulates melatonin levels and helps sleep and fight hormonally driven cancers). 19: You must stimulate both body and mind. Use light massage, reflexology, healing. It is a proven fact that visualisation, yoga and meditation all help boost the immune system and have a significant effect on long-term survival rates, so take time each day to use relaxation techniques. 20: Fatigue comes with every chemo treatment! Yes you can and should rest. Moreover, research by Italian scientists has identified that it is linked to loss of carnitine in the blood as a result of the chemotherapy toxins. In tests (albeit involving just 50) patients given a high energy drink containing levocarnitine 90% of the patients no longer felt tired just a week after starting the drink. We stress the need to consult your medical practitioner at all times when taking supplements. Whilst some (for example the use of ginger to quell nausea; or the use of medicinal mushrooms to reduce side effects) have come through clinical trials, other ideas have come through expert research only. More can be found throughout this web site especially in our research centre Cancer Watch.